Dr. John “Dr. Algae” Benemann will be a featured speaker at ABS on topics relating to algae in the New Carbon Economy. 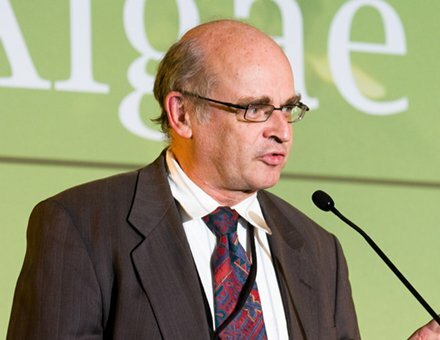 he upcoming Algae Biomass Summit, October 14-17, in the Woodlands, Texas, has designated a major portion of the event as “Algae in the New Carbon Economy,” headlined by industry icon, Dr. Algae, aka John Benemann. A pioneering 40+ year algae scientist and consultant, Dr. Algae will share first-hand stories of the birth of the modern algae industry. He will elucidate the evolution of algae utilization, from simply a tool to clean water to the advanced applications for carbon capture, use and storage. Dr. Benemann, who has supervised dozens of algae projects and mentored hundreds of algae scientists, is currently CEO of MicroBio Engineering, a team of engineers and scientists that provides a wide range of business and technical services for the development of microalgae systems. Algae scientists have made major advances in the use of algae for the production of advanced biofuels and biomaterials, and are emerging as a key enabler for carbon capture, use and storage (CCUS). With support from the Department of Energy, algae-based systems for CO2 mitigation are operating at power plants and manufacturing facilities in the U.S., Canada and around the world. New commodity-scale markets for algae grown on recycled carbon are also emerging. At ABS the Algae Biomass Organization and The Center for Carbon Removal will present cutting-edge research results, the latest in commercial developments, and conversations on Algae in Carbon Capture, Manufacturing and Energy. Keynote Presentations on the New Carbon Economy Roadmap will be presented by Matt Lucas, Center for Carbon Removal and David Babson, Senior Advisor, Office of the Chief Scientist, at the U.S. Department of Agriculture. The Plenary panel “CarbonTech and the New Carbon Economy” will discuss research, commercialization, investment, deployment, and policy, as well as the process of consuming carbon emissions as a resource, while reducing the carbon footprint of industries large and small. Mark Allen, V.P. Integrated Carbon Solutions at Accelergy Corporation, will moderate the panel composed of distinguished panelists from across the New Carbon Economy. A technical session on Carbon Capture for Algae will also be offered, with a panel consisting of Chris Romans, Mitsubishi Heavy Industries; Greg Fleming, Air Liquide; Jan Wurzbacher, ClimeWorks; Amy George, Earthly; and Eric Mork, ICM. Capping off the carbon intensive will be a panel on “Navigating the Dual Role of Carbon as Pollutant and Critical Feedstock,” featuring John Benemann, with Braden Beckstrom, of Colorado State University; Michael Wilson, from University of Kentucky Center for Advanced Energy Research; Everett Eustance, of the Swette Center for Environmental Biotechnology and Sridhar Viamajala, from the University of Toledo.